The presentation ceremonies for the 35th annual Catholic Mass Media Awards (CMMA) was held last night at the GSIS Theater in Pasay City. 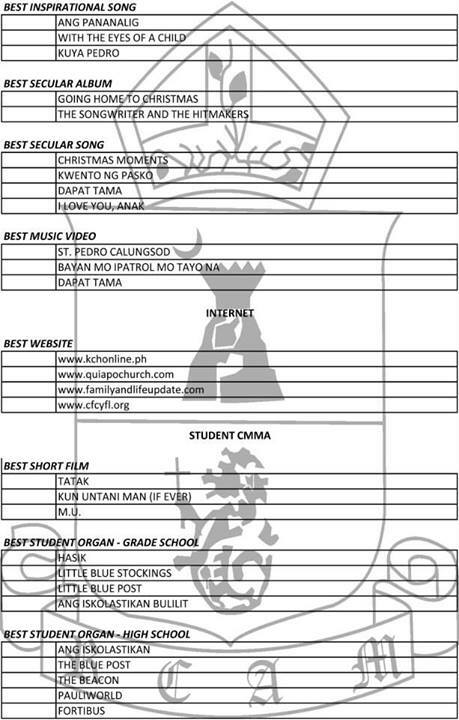 According to the CMMA Facebook page, they received 737 entries this year in 57 categories. Of the 737 nominees, only 216 were selected as finalists. This entry was posted on Saturday, November 16th, 2013 at 2:28 pm	and tagged with 35th Catholic Mass Media Awards, 35th Catholic Mass Media Awards nominees, 35th CMMA winners, Catholic Mass Media Awards 2013, Catholic Mass Media Awards 2013 finalists, Catholic Mass Media Awards 2013 winners, CMMA awards 2013 and posted in hodgepodge, personal matters, philippines. You can follow any responses to this entry through the RSS 2.0 feed.